With my college graduation date approaching faster than I ever could have imagined, everyone I know is talking about graduation dresses. Should we stick with all white? Does it matter since we’ll be covered in huge, black gowns? I’ve come to realize that the most important part of your graduation outfit is … your shoes. Under your big robe, square cap, and hopefully tons of honor cords, no one can really see what dress you spent hours, maybe even days, trying to pick out. Your shoes, on the other hand, will be out in the open. I learned from four years of Catholic high school uniforms that when everyone is in uniform, your shoes stand out more than you’d ever imagine. Curious as to what shoes I’m dying to wear for graduation? 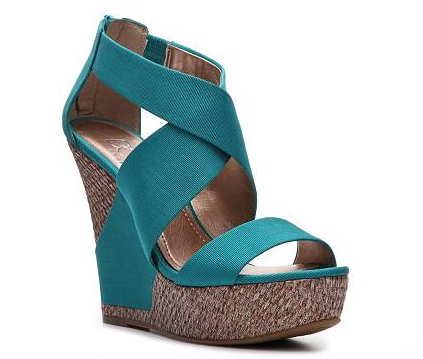 None other than the star of the latest DSW commercials, the BCBG Paris Rando Wedge Sandal. If you’ve finished gazing at the above photo in awe, read on. The BCBG Paris Rando Wedge Sandal, currently on sale at DSW for $69.95 (regularly $110), is the perfect bold statement shoe. A lot of people tend to stick with a neutral shoe at graduation, and, to be completely honest, I’m not sure why. When everyone is wearing the same plain robe, there is no better way to stand out than to rock a wonderfully colorful shoe. The 1.5 inch platform makes these wedges significantly more comfortable than their 4.75 inch heel makes them look. In combining a turquoise fabric upper with a woven wedge heel, BCBG has managed to create the most effortlessly lux shoe imaginable. It’s cool without trying. Bonus: If you wear a wedge, you don’t have to worry about your heels sinking into the football field during the commencement ceremony. The shoes are great. Good luck on your graduation. You could try Zappos, Amazon, or eBay!